Use sweet potato instead of potato. This is a more interesting twist on the traditional cottage pie! When the onions and carrots are softened, add the chopped garlic, and fry the garlic for a few minutes. Then turn the heat up to medium-high, and add the beef mince, frying for a few more minutes until the meat is browned. When the tomato puree has been cooked out, raise the heat to high, add the beef stock (and the red wine if using), and bring to the boil, then leave on high heat for 5-8 minutes to reduce the liquid/cook out the wine. When the liquid has reduced, the mixture shouldn’t be too wet. Add the Worcestershire sauce and season with salt and pepper, and pour into a deep, ceramic baking dish, and allow to cool a little. By now, your potatoes should be cooked. Mash the potatoes with the butter, and when mashed, add a splash of milk, the wholegrain mustard (if using) and season with salt and pepper. Stir to combine. 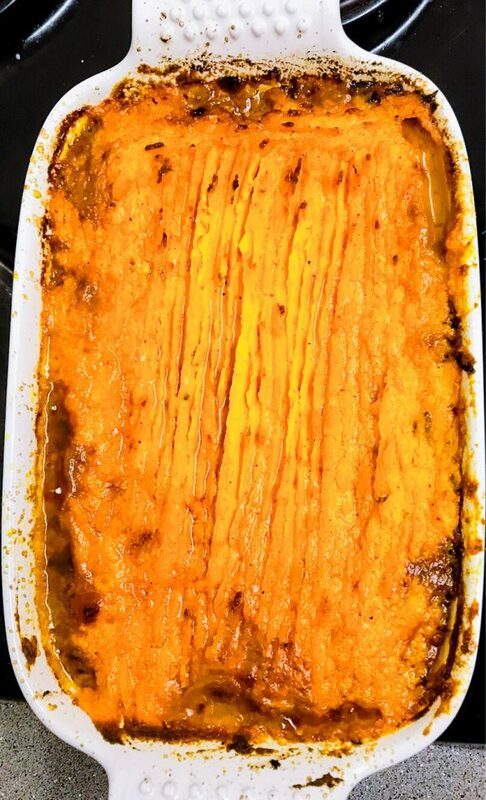 Then put the cottage pie in the oven, and cook for 30 minutes, or until the surface of the mash is browned. Then remove from the oven and allow to cool for 5 minutes before serving. Serve with seasonal vegetables (peas would be an easy accompaniment to this dish).